Set in the wall above what used to be the South Porch of Benthall Church, this is an interesting example of a vertical sundial. The position of the base of the gnomon, exactly on the noon hourline confirms that the nave of the church runs East-West and that this wall faces due South. The sundial was made in 1893. In "Benthall Parish Church, A History" by Sir Paul Benthall, K.B.E., an unusual story is told: "...a little turret was built and a sundial was placed on the south front. The gnomon was set in a semicircular depression lined with small coloured tiles to represent a human left eye. ( The symbolism is obscure). Above the sundial is the text "Out of the strong came forth sweetness", referring to Samson's riddle, and below is a lion's head carved in stone from the mouth of which a pipe used to lead into a beehive in the gallery. Dr. Cranage, who at the turn of the century wrote a comprehensive book describing all the churches in Shropshire, recorded with amazement that this was done in the hope that wild bees would enter the hive, and asked whether anyone could question the originality of modern church renovators. However, in actual fact, the churchwardens, who were keen beekeepers, put their own bees in the hive and sold the honey on behalf of the poor of the parish. The bees remained for a number of years, bu then migrated into a neighouring tree. " 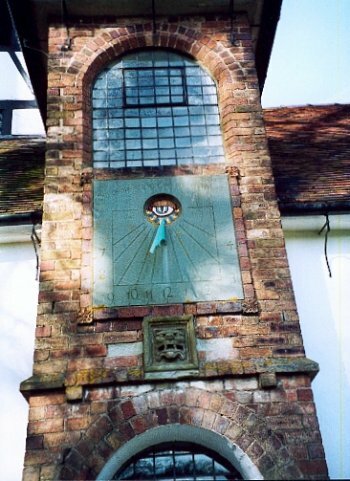 In 1961, Sir Paul Benthall, in memory of his cousin Mary Clementina Benthall, arranged for the renovation of the sundial and a new face of green slate was fixed. The work was designed and organised by the Warham Guild.